If you are launching a business that either directly or indirectly will depend on the hot trend of 3-D printing, the Midwestern town of Youngstown, Ohio, needs to be on your radar. Once known for its steel manufacturing prowess, Youngstown is re-emerging as the national leader of innovation in this next generation of manufacturing. 3-D printing machines in the Youngstown center. Youngstown drew the spotlight last week in President Obama's State of the Union address, when he pointed to the town as an example of a manufacturing innovation hub. He said he would use his executive authority to launch three such hubs in an effort to re-energize U.S. manufacturing. The innovation center in Youngstown is conducting research to develop the process of additive manufacturing, which is the technical term for 3-D printing, the process by which successive layers of material are laid down one on top of another. “Additive is in the 1980s of desktop publishing right now, we are just starting to understand what it can do,” says Scott Deutsch, communications manager for the National Center for Defense Manufacturing and Machining, the organizing body behind the innovation hub. The goal of the hub is to push forward the understanding of 3-D printing so that it can be more widely implemented. You might expect such a hub to be in a high-tech hot-spot such as Silicon Valley, but Youngstown has a long history as a manufacturing center. “We have a great culture of manufacturing here. We have a great work ethic. We have the DNA for manufacturing in this part of the country,” Deutsch says. 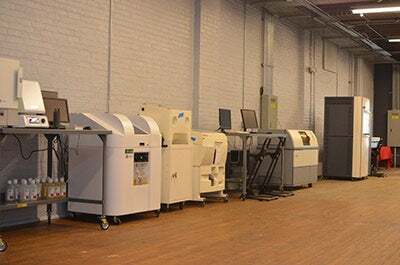 A once-shuttered warehouse in Youngstown has been renovated to be the home for the center, called The National Additive Manufacturing Innovation Institute. This advanced-manufacturing technology has appeal for industries that need only one specific replica of a particular part, especially a part that needs to be made out of an expensive material. For example, whereas automotive manufacturers make hundreds of thousands of cars needing massive quantities of each part, the military makes only a handful of battleships at a time, says Deutsch. The ability to create one single part, out of a specific and, in some cases very costly, material bypassing the traditional manufacturing process is very appealing to the military. Also, 3-D printers provide the ability to make parts on-demand and on-location. For many businesses, this provides an opportunity to save energy typically expended shipping items from say, a manufacturer, to an assembly line, Deutsch explains. And in the medical field, patients who need prosthetics also benefit from the technology because additive manufacturing allows doctors to manufacture a single, personally-sized hip or arm replacement, for example. Youngstown is just the pilot for Obama’s idea to create advanced manufacturing hubs across the U.S. Obama asked Congress to authorize $1 billion for 15 such hubs. Youngstown’s additive manufacturing facility was set up with a $30 million commitment of funding from a collaboration of five federal agencies, spearheaded by the Department of Defense. The government funding was coupled with $40 million in private funding for a total of $70 million in commitment, says Deutsch. How would you re-energize U.S. manufacturing? Leave a note below and let us know.